So You've Probably Seen Enjoy Life Foods Around Here On The Blog & Today I Have Another Sweet Treat For Ya! My Big Guy Has Been In School For A Few Weeks & He's Doing Great Eating Gluten-Free! In Our Household I Love Feeding My Children Healthy & All Natural Food's, So I Was Excited To Introduce My Big Guy To Enjoy Life Foods Crunchy Cookies! Available In Four Exciting Flavors Like Chocolate Chip, Double Chocolate, Sugar Crips & Vanilla Honey Graham! Like All Enjoy Life Foods Products They Are Dairy, Nut & Gluten-Free, These Cookies Contain No Artificial Ingredients Or Trans Fat! These Yummy Cookies Won't Last Long In Your House! 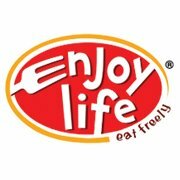 Want To Find Out More About Enjoy Life Foods? Check Out My Previous Post HERE! You Can Purchase Enjoy Life Foods At Natural Food Stores Or Online! Connect W/ Enjoy Life Foods On Facebook, Twitter & Pinterest!